The phone rang a week or so before the spring bank holiday weekend. Friend of the "better 'alf" - "can we come and stay for a few days?" "Oh no", said my son. "How will we survive all those girls?" (Friend has two daughters aged 10 and 7). "We'd better have a day out......"
The result was that we joined the 0742 for Edinburgh at Wolverhampton, for the run to Carlisle, on the Wednesday after the bank holiday. Arriving at 1035, we wandered down the platform to join the 1101 to Barrow in Furness. The train was formed of a two-car class 108 DMU; the declassified first at the front was vacant, so we took the seats with the prime view forward and settled down for the journey to Ravenglass, our objective. I had not travelled along this stretch before, and had looked forward to the journey. I was not disappointed. The first part, from Carlisle to Maryport (along the metals of the former Maryport and Carlisle, oddly enough) was quite delightful, with the atmosphere of a rural route of some years ago. The stations, while modernised to an extent, retain many of their original buildings, and some old signal boxes remain. From Maryport to Whitehaven, the line is ex-LNWR. The line follows the coast very closely, at times virtually on the shore, while at other times, particularly in the vicinity of Workington, industry dominates. The Moss Bay steel works is still active, as Britain's only producer of steel rails, and we noted a works shunter ambling down to the interchange sidings with some loaded wagons. 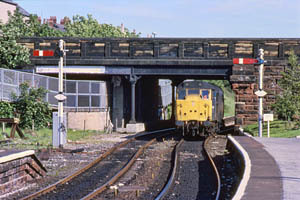 At Whitehaven, some trains from Carlisle terminate, and a bay platform showed signs of regular use. The connection to the docks has now been lifted however. The station itself marks the point at which we enter Furness Railway territory - our first sight of which was to be the single-bore Corkickle tunnel! Just south of Corkickle is Mirehouse junction. The rusting tracks which made their way to the south-east here are the last remnant of a maze of mineral and other lines which were a salient feature of the West Cumberland industrial area. Such lines as the Whitehaven, Cleator and Egremont Joint (FR & LNWR), or the Rowrah and Kelton Fell, are now but a memory. We now entered the longest stretch of single track, the driver taking the single line token. Industry is almost left behind, apart from the domes and minarets of the Sellafield complex. The twin towers involved in the 1957 fire are now undergoing a slow and painstaking demolition. In the siding, a class 31 stood on a train of (presumably empty) nuclear flasks. It gave every sign of being ready to depart, and in fact passed through Ravenglass about half an hour after we arrived there. We saw this train twice more on our way home - after it acquired an extra 31 for the main line. The next train out of Ravenglass on the 15" gauge was a diesel, so we took the opportunity for a bite of lunch and a cup of tea. It is not always appreciated how far off the beaten track this corner of Cumbria is - there are no direct roads, and our journey by rail had taken the best part of five hours! Had we come the direct (!) route, via Barrow, we would still be on our way! The weather on leaving Shropshire had left much to be desired, however the forecast had been good, and sure enough we now had an almost clear blue sky for our run up the valley. Our locomotive was "River Esk", the black liveried 2-8-2 built in 1923 specially for the line by Davey, Paxman of Colchester. This journey was particularly appreciated by my son, until he got an eyeful of ash! A quick swap of seats, to face back down the train, cured the problem. The "Ratty" really is a super line, and well worth a visit, with fine locomotives, lovely scenery, and sometimes it doesn't rain! One of the fine locomotives was a visitor - from the Romney , Hythe and Dymchurch, Krupp-built "Black Prince" of 1937. My only disappointment was that I was unable to photograph this loco - we only saw it passing by at one of the loops. Returning to Ravenglass by the same train, we continued our journey on the 1608 to Barrow, again a class 108 DMU. I had travelled most of the remaining route previously - on a "Cumbrian Coast Express", hauled outwards by "Leander" and back again by "Lord Nelson". The steam train had travelled via the short freight-only link from Park South Junction to Dalton Junction, avoiding the circuitous loop through Barrow - so Barrow meant new ground! From Barrow to Preston, we would travel on the 1734 to Manchester Victoria. "What sort of train it will be, Dad?" Shortly after we arrived at Barrow from the west, 31 400 and a short and motley rake of mark IIs arrived from the east. Clearly the shortage of DMUs is having some interesting effects. After a remarkably quick run round (which put the antics at Wolverhampton with Shrewsbury trains to shame) this was announced as the Manchester train, so after topping up our "vittals" we found ourselves some seats. We need not have bothered - there was a trolley service on the train. So we traversed the scenic stretch back to Carnforth in comfort. The highlights of this line are the long low viaducts across the Leven estuary, near Ulverston, and the Kent at Arnside. At Carnforth we joined the West Coast main line again, and ran quickly down to Preston, where we had just over an hour to wait before joining the Edinburgh - Coventry train. This seems to be the return working of the stock we had travelled in earlier. "How about a cheeseburger, dad?" Disaster - cheeseburgers no longer seem to be on the Travellers Fare menu. Fortunately, pizza is very fashionable these days (blame the teenage mutant hero turtles), so the French bread variety filled the gap suitably. We arrived back in Wolverhampton at about twenty minutes to ten. This was the only train of the day that was not punctual to the minute, arriving about five late, and this only to ensure connections from a late running Glasgow - Euston, at Crewe. Conclusions? An excellent day out, or, to quote my son, "Brill"!